Oracle CEO Larry Ellison relied on a time-tested bromide to sell a conference crowd on the vendor's array of HCM (human capital management) applications on Thursday. "When you're running the business, it's all about the people," Ellison said during the HCM World event in Las Vegas. "You can't run a successful business or government agency if you don't take care of your people. And you can't be a successful company if you don't take care of your customers. You can't be a successful government agency if you don't take care of your constituents." Effective HCM software gives people the tools they need to do their jobs well, Ellison said. HCM can also help companies recruit the right people, bring them on board, and make sure the best employees are getting the appropriate rewards, he said. "You should be constantly communicating with your people," Ellison added. "The people then themselves have to connect with each other." HCM software should provide this social interaction layer, he said. To this end, Oracle HCM is integrated with the vendor's Social Network software, which has a Facebook-like interface. Oracle is in fierce competition with other HCM vendors, such as SAP, Workday and Cornerstone on Demand. While Oracle has already long offered PeopleSoft HCM, which is typically deployed on premises, of late it has spent big to build out its cloud-based HCM portfolio with deals such as the US$1.9 billion purchase of Taleo in 2012. HCM has become a particularly strategic application category for a number of reasons, particularly its breadth. A company might initially add recruiting or employee orientation modules to its core payroll and benefits system, then later on bring in learning and development or employee performance management. Large companies, particularly, may also invest in HCM-related analytics, such as for workforce planning or pinpointing top-performing but dissatisfied employees who may be looking to leave the company. The span of capabilities was in evidence during Ellison's talk as he displayed slide after slide outlining Oracle's panoply of HCM modules. In addition, many types of HCM software are licensed for all employees in a company. While the per-user cost for many modules tends to be fairly low, the deal sizes add up when they're struck with a multinational corporation. Ellison wasn't talking about the piles of cash Oracle hopes to make with its HCM portfolio on Thursday. 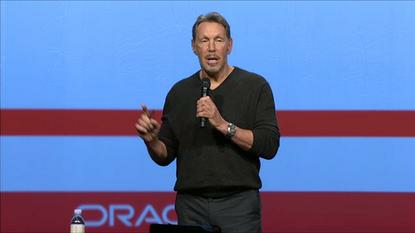 Instead, he talked about how Oracle's customers could become more successful with the technology. "For years and years, we talked about empowering people," he said. "I think it's not that simple. You've got to give them tools, hook them up to mentors, give them learning tools, career planning tools, so when you do empower them they have the right perspective and the right skill set to make a contribution to the company." He also underscored the importance of social networking to HCM. "People are interested in what other people are doing," Ellison said. "People are thirsty for information about what the company is doing. The ability to get people to connect -- to connect to the company, to one another -- is going to make for a very satisfied workforce. If you can reduce turnover, that's a dramatic productivity improvement for your company."